A 26 metre new build Ferretti 850 motor yacht has been sold to an Asian client by Lee Marine in Phuket, Thailand, marking the first sale of this model in Asia. Designed by Zuccon International Project, she is being built in GRP by Italian yard Ferretti to RINA class with delivery scheduled for 2017. Accommodation is for eight guests in four luxurious cabins below deck, consisting of a master suite, VIP suite and two twins, all with en-suite bathroom facilities. In addition, two twin cabins in the bow accommodate four crew. The open-plan saloon is dominated by huge windows allowing natural light to flood in. This area has a comfortable lounge aft and a cosy dining room forward while the aft deck, sheltered by the flybridge above, offers al fresco dining and entertaining. A neat feature is the large transom door which, when lowered to sea level, creates a vast beach club with easy access to the water for launching toys and tenders. Up on the flybridge is a built-in upholstered seating area forward protected from the sun by a hard top, while aft is a sunbathing area with sun pads and loungers. Twin 1,775 MAN diesel engines power her to a maximum speed of 29 knots. 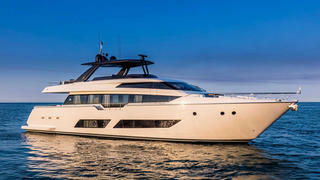 The asking price of the Ferretti 850 has not been disclosed.